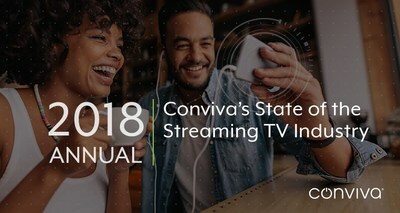 FOSTER CITY, California, Jan. 29, 2019 /PRNewswire/ -- Conviva, the real-time measurement and intelligence platform for streaming TV, today released its 2018 Annual State of the Streaming TV Industry report. The report sheds new light on market dynamics and challenges in context of skyrocketing consumption, growing consumer impatience, spikes in global live viewership, and shifting device preference. Skyrocketing Expectations and Viewership: Across Conviva's customer base, 2018 saw 89% growth in overall viewing hours for the year, including 165% growth in Q4. With this growth, Conviva observed the convergence of heightened viewer expectations and waning patience. A global 7% year-over-year increase in the rate of abandonment translated to 14.6% of viewers leaving before their video started. The effect was amplified when viewers faced delays in situations where they expected the experience of traditional TV viewing, such as on connected TVs, watching live content, and via content aggregators (vMVPDs such as Hulu, Sling, PlayStation Vue, and DirecTV Now). As the number of viewing hours increases in this progressively more complex landscape, this is a trend that will be critical to watch and address. "Live events have a way of connecting us on both a local and a global scale. The ability to watch and be a part of exciting news, sports, and other developments as they're happening is attracting viewers in droves," said Conviva CEO Bill Demas. "The real-time demands of streaming mean that providers who remain vigilant and have visibility into every aspect of the viewer experience will win the loyalty of their viewers." "As streaming becomes a bigger part of their everyday lives, viewers continue to migrate toward devices and services that offer those best-in-class experiences," said Demas. "With more options emerging, their expectations are higher than ever." Data for Conviva's Annual State of the Streaming TV Industry report is collected using the company's proprietary sensor technology, which is embedded directly within 3 billion video applications streaming on devices globally. Conviva currently measures 1 trillion data events per day for top streaming TV providers worldwide, across 180 countries and five continents. In this report, the year-over-year data was normalized for a consistent set of Conviva customers in both 2017 and 2018. Conviva is the real-time measurement and intelligence platform for streaming TV. Conviva's Video AI Platform provides insight into streaming TV consumption, engagement, and viewer experience across every second, every stream, and every screen. With a global footprint of 50 billion streams per year across 3 billion applications and 200 million users, Conviva serves more than 200 brands, including HBO, Hulu, Sky, Sling TV, Turner, Univision, and more. The company is privately held and headquartered in Silicon Valley, California, with offices around the globe. To learn more, visit www.conviva.com.